This is the place that made me fall in love with Capitol Hill and a true gem of DC. If you haven’t been here yet, mark the address: 7th & C St SE. I first stumbled upon Eastern Market as a hungry student, delighted to partake in generous free sampling of sumptuous local produce. I love walking and – I guess partially due to my European background and partially due to more primordial self-preservation instincts – I absolutely need to be able to walk to places where I can feed myself (i.e. no suburbs for me). But in addition to providing me with daily sustenance Eastern Market every Saturday and Sunday becomes the pulse of the neighborhood. Like clockwork, it counts the seasons through delicious colors, flavors, and smells: sweet strawberries in the spring, palate-pleasing peaches in the summer, cider in the fall, and fragrant fir wreaths in the winter. And everything in between – parsley, sage, rosemary and thyme – a modern-day Scarborough Fair. Well, not so modern, at least by the U.S. standards. 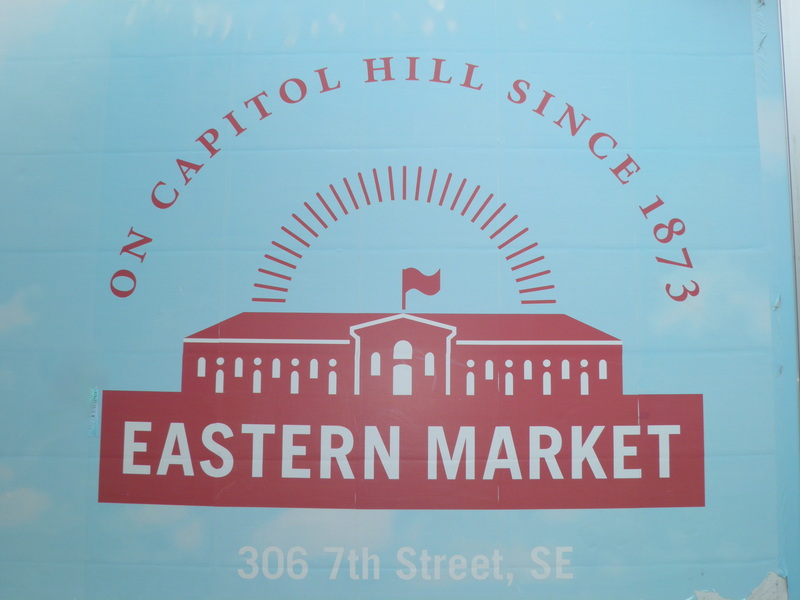 Eastern Market was one of several markets that prospered in Washington in the 19th century. Designed by a German architect Adolf Cluss who emigrated from his native Heilbronn in 1848, Eastern Market was built in 1873 as a hallmark of a modern city undergoing a post-Civil War boom. 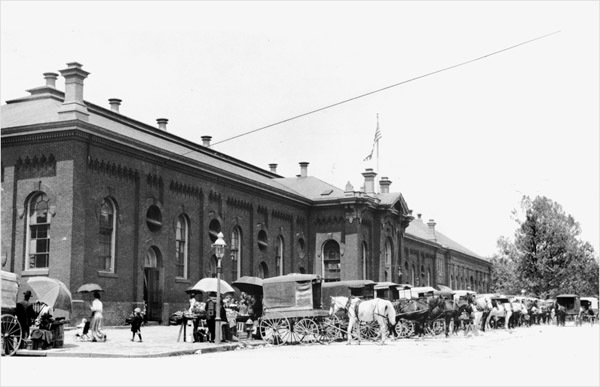 A well-ventilated and naturally lit, spacious market replaced its dilapidated namesake established by Jefferson’s Presidential Proclamation in 1805 close to the Navy Yard on 6th between K and L streets. The current structure is the oldest still standing and continuously operating such market in the city. There used to be others. Ever wondered what was on the spot where the National Archives now stand? A bigger version of Eastern Market: Center Market built in 1871 as the largest market in America at the time, razed in 1931 to make space for the Archives — a place meant to preserve history. Sadly ironic. Eastern Market avoided the fate of its big brother thanks to citizen initiatives that protected it from, among others, becoming a highway in the early 1960s. 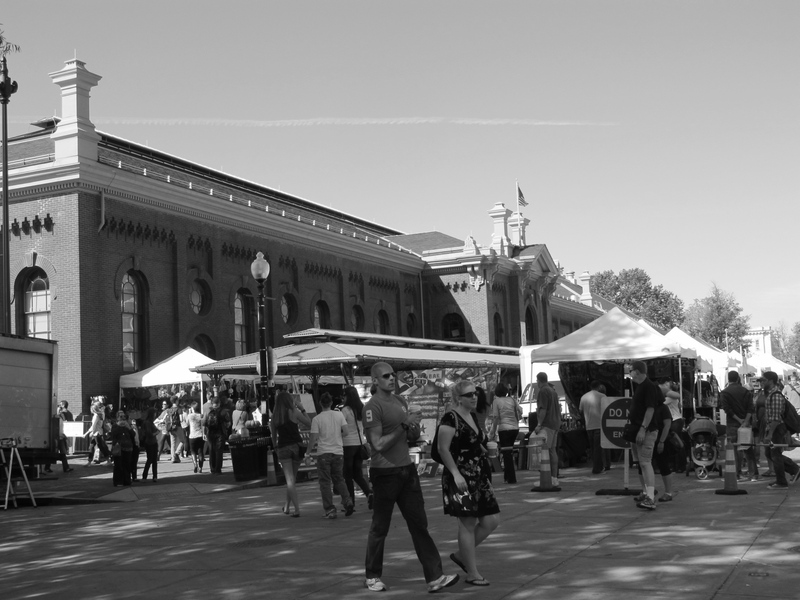 In 1964, the market was classified as a DC historic landmark and in 1971 joined the National Register of Historic Places. Since then the only thing that can touch it is a natural disaster, as it indeed did on April 30, 2007. I used to live in a building across the street from the market at the same and seeing its smouldering bones on that morning was one of the most aweful sights. But what followed this devastating fire was truly heart-warming effort of the Capitol Hill community to resurrect the market. Then-mayor Adrian Fenty immediately promised to rebuild and residents came together to raise donations so that the vendors can stay in business trading at a temporary structure. It worked and on June 26, 2009 the renovated market reopened – more beautiful and full of life than ever.